Welcome back. Today I have the pleasure of introducing a guest post by a writer who’s new to this blog: Sharon F., a recently retired elementary school principal in southern Ontario, Canada. Although Sharon and I have never met, I enjoyed her posts on the Stage of Life website, invited her to prepare a post for this blog, and she kindly accepted. As you’ll read, along with writing, Sharon walks…and walks. What does it take to be considered fit? This year, my first year of retirement, I’m learning that it takes a lot of effort to achieve this state. Every past January, I’d challenge my students or fellow staff members to set goals for the upcoming year. Some would invariably scoff at the idea, “I never keep my resolutions, and so I don’t bother to make them anymore.” Others would share their resolutions – to spend more time with family and friends, work on their hobbies, eat healthy meals, or perhaps go on a diet. Many would share the desire to get fit, whatever that means. How can we define personal fitness? Dr. Google says, “Fitness is good health, especially good physical condition resulting from exercise and proper nutrition.” In the 1960s in Japan, 10,000 daily steps was promoted by pedometer companies and walking clubs as a way to achieve fitness. The American Heart Association uses 10,000 steps as a guideline for improving health and decreasing risk of heart disease.10,000 steps is roughly equivalent to walking 5 miles. 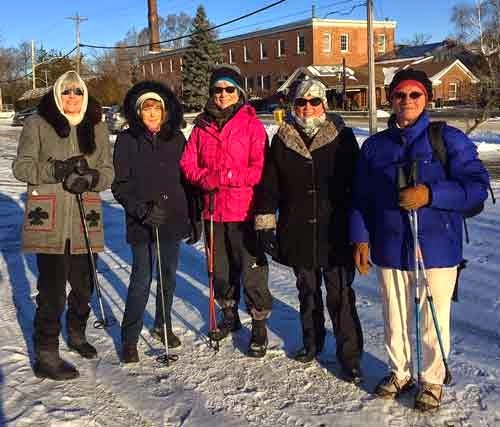 of a local walking club. If the ability to perform prolonged walking is an indicator of fitness, I was able to achieve this in my former career as an elementary school principal. In my daily rounds, I would walk the exterior and interior space of the school several times. I walked the playground at each recess, and I patrolled the parking lots and sidewalks at entry and exit time. I walked into classrooms and up and down hallways. As a school goal, we decided to walk the length of our country. Every student and staff member walked and charted until we achieved that goal one spring. After I closed the school door on my last day of work before retirement, I had to find a new way to keep fit. In my youth, fitness just seemed so easy to maintain. It was easy to go for a run, ride a bike, work out at an exercise class and follow up every activity with a piece of pie, slice of cake, stack of cookies, or bag of chips and still feel fashionably fit. Not so any longer! Buttons no longer stay buttoned, and zips no long zipped! My entire wardrobe seems to have mysteriously shrunk. I knew I had achieved problem status when my cozy sweatpants with the elastic waistband acquired permanent choice status for every social occasion. One evening, dressed in my sloppy sweatpants and oversized sweatshirt, I watched the documentary film, Fed Up. It shocked me. I could see where my recent trend of inactivity and overindulgence of sweets was leading. I was fit for a change! At Christmas, a special present arrived from my son. 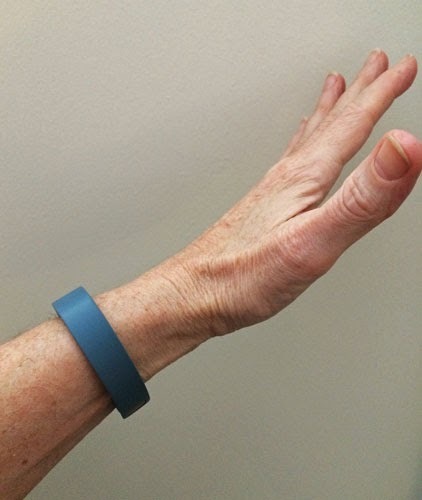 It was a wristband monitor – guaranteed to help me be fit. This amazing device guaranteed to encourage me to walk regularly, monitor my caloric intake and register the results on my computer or smartphone. My brain got a fitness workout as I learned how to download and install the program and read the results. I put it on and adjusted the band until it fit to a tee. Personal fitness here I come! Sharon’s adventures with her new fitness device will continue next Tuesday. I hope you’ll be back. Thanks for stopping by.